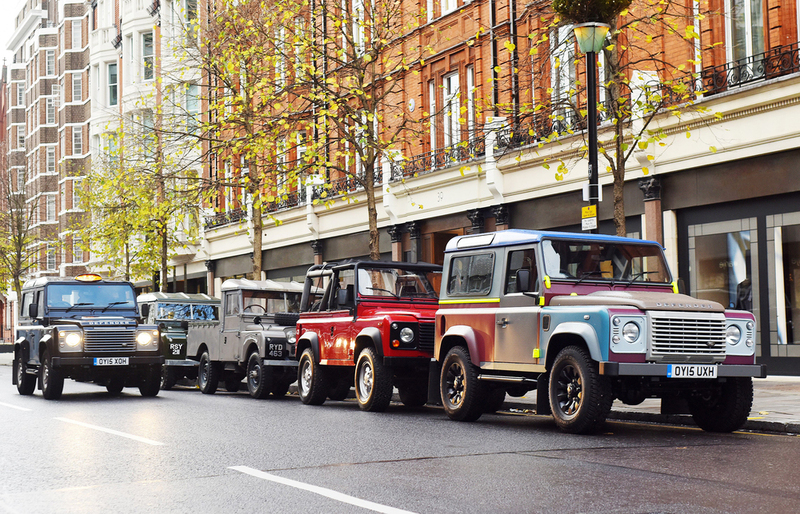 A one-of-a-kind Land Rover Defender 'taxi' startled Londoners as it drove through the streets of the capital. The iconic 4x4 was starring in a film to commemorate 67 years of the Defender as it enters final phase of production, while also helping promote a forthcoming charity auction of the special 'Defender 2,000,000' model being held at Bonhams on 16 December. All proceeds from the auction of Defender 2,000,000 will be donated in their entirety to Land Rover's humanitarian and conservation partners - the International Federation of Red Cross and Red Crescent Societies (IFRC) and the Born Free Foundation. The film also stars a number of other more unusual, specially modified vehicles including a Series II Land Rover ice cream van, a specially tailored Paul Smith Defender and the first ever Series Land Rover show car, displayed at the Amsterdam Motor Show in 1948. The special Defender features many distinctive finishing touches. A map of Red Wharf Bay - where the design for the original Land Rover was first drawn in the sand - is engraved on the car, which contrasts with the exterior Indus Silver satin paint. A unique 'no 2,000,000' badge sits on the rear of the vehicle, which is mirrored on the interior console. The design is finished with Santorini Black wheels and wheel arches, roof, door hinges, grille and mirror caps. Inside, the leather seats also feature the 'Red Wharf Bay' graphic and 'no 2,000,000' logos have been stitched on the headrests. A bespoke aluminium plaque, signed by everyone who helped to assemble the vehicle is fitted to the driver's seat plinth. On the front and rear, S90 HUE registration plates - a reference to the first ever pre-production Land Rover, registration 'HUE 166' - complete this one-of-a-kind Land Rover Defender. Production of the original Land Rover Series I began at the Lode Lane facility in 1947 ahead of its launch at the Amsterdam Motor Show on 30 April 1948. Since then two million examples of the Series I, II III and Defender have been produced at Solihull.